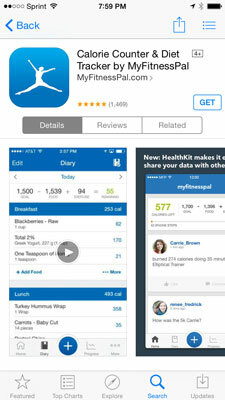 Download MyFitnessPal from your device’s app store. 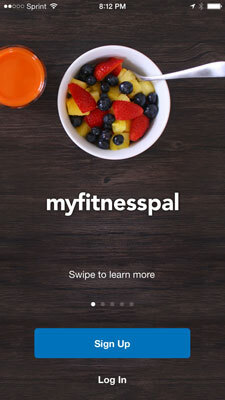 MyFitnessPal is compatible with Android, Windows, and iOS devices. Locate the app in the store for your device and download it. It’s completely free, never a premium. Once you have the app, tap to open it. Log in to your account (or create one). 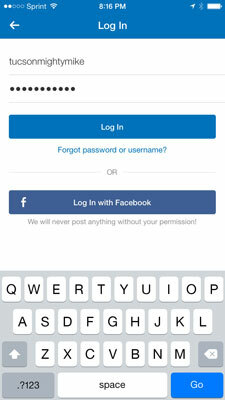 If you already have an account you created on the website or another device, just tap Log In. If you need to set up a new account, tap Sign Up. You can use just your email address, or you can sign on through your existing Facebook account. The main difference is that the Facebook connection will locate all your friends who also use both Facebook and MFP. You can always enter friends manually or hook up to Facebook later. One way or another, you’ll get to the Log In screen. Enter the same information here you used to create your MSF account. If you jump through all those hoops successfully, you’ll wind up on the Home page for your account. 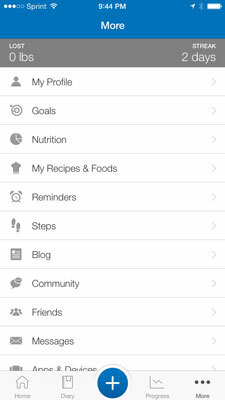 At the top of your home page is a formula showing your calorie goal for the day and how much you can eat before you get there. In the middle of the screen is your newsfeed, which displays your activity, that of any MFP friends you’ve connected with, and an occasional ad. The toolbar at the bottom of the screen is the place to go to make diary entries, check your progress, and get to most of the app’s settings. Tap the + button to make an entry. You’ll get to those soon enough. For now, tap the More button to see more options and settings. On the More page, you find access to all of the MFP features. You can update your profile and goals, , study your nutrition habits, read blogs by other members, find friends, set reminders, sync to your activity tracking devices and apps, and much more. Tap Diary to see where you are for the day. You can review what you’ve already eaten as well as add more food. 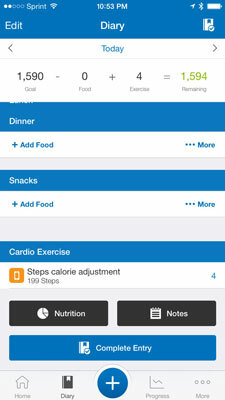 Scroll down to see any data that has been synced from your activity tracker or another health-related app. 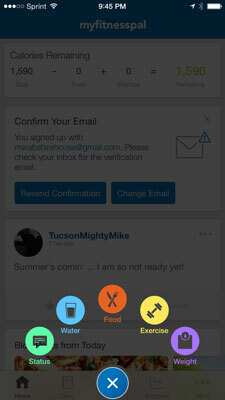 Tap Progress to see a report on previous activity. 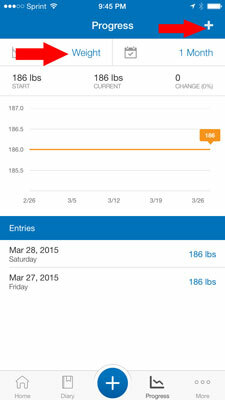 After you’ve been using MFP for a while, the Progress page will be a lot more interesting. You’ll be able to see a summary chart for your various measurements. Weight appears by default; if you tap it you can change the view to another measurement, such as Steps or Hip or Waist or anything else you’ve been tracking. 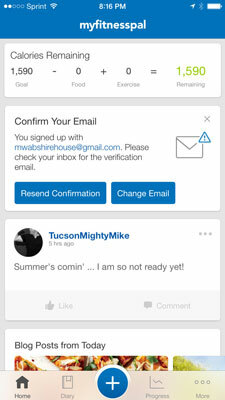 To add a new check-in, tap the + sign.